2 2. Identify from drawings and know the purpose of each of the following parts of a seed: endosperm, radicle, plumule, micropyle. 3 3. Know several differences between a monocotyledon seed and a dicotyledon seed, and give three examples of each. 4 4. Explain the purpose and use of a "rag doll" seed tester. Use it to test the germina­tion of 100 seeds of a wild plant and 100 seeds of a domestic plant. Report the results of each test. 5 5. How does a seed differ from a spore? 6 6. Write or tell orally two spiritual lessons we may learn from seeds. You will find help in Christ's Object Lessons by Ellen G. White, pages 33 to 89. 7 7. Make a collection of 60 different kinds of seeds, of which only 15 may be collect­ed from commercial seed packages, the other 45 you are to collect yourself. Label each kind as follows: seed name, date collected, location collected, and collector’s name. 8 8. Have in your collection four kinds of seeds from each of two families of plants, showing the similarity between the seeds of plants in any one family. Instructions and tips for earning the Seeds honor can be found in the Nature chapter. 2. Identify from drawings and know the purpose of each of the following parts of a seed: endosperm, radicle, plumule, micropyle. Diagram showing the endosperm and radicle. Endosperm is the tissue produced in the seeds of most flowering plants around the time of fertilization. It surrounds the embryo and provides nutrition in the form of starch, though it can also contain oils and protein. The radicle is the first part of a seedling (a growing plant embryo) to emerge from the seed during the process of germination. The radicle is the embryonic root of the plant, and grows downward in the soil. The plumule is the embryonic shoot. It is the precursor to the stem and leaves of the plant. The micropyle is an opening in a plant's ovule (the structure that gives rise to and contains the female reproductive cells). The micropyle opening allows the pollen tube to enter the ovule for fertilization. In gymnosperms (e.g. conifers), the pollen itself is drawn into the ovule and the micropyle opening closes after pollination. 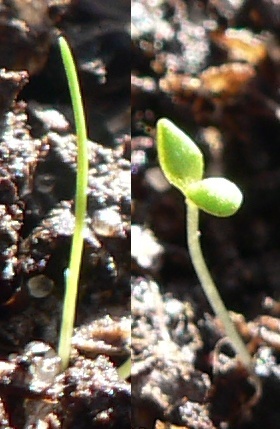 During germination, the seedling's radicle emerges through the micropyle. 3. Know several differences between a monocotyledon seed and a dicotyledon seed, and give three examples of each. In monocotyledons (or simply monocots), the seed embryo has one cotyledon while the embryo of the dicotyledon (or dicot) has two. The major leaf veins in a monoct are parallel, but they are branched in a dicot. The flower parts (petals, sepals, etc.) in monocots are multiples of three while in dicots are multiples of four or five. 4. Explain the purpose and use of a "rag doll" seed tester. Use it to test the germina­tion of 100 seeds of a wild plant and 100 seeds of a domestic plant. Report the results of each test. 5. How does a seed differ from a spore? A chief difference between spores and seeds as dispersal units is that spores have very little stored food resources compared with seeds, and thus require more favorable conditions in order to successfully germinate. Seeds, therefore, are more resistant to harsh conditions and require less energy to start cell division. Spores are usually produced in large numbers to increase the chance of a spore surviving. 6. Write or tell orally two spiritual lessons we may learn from seeds. You will find help in Christ's Object Lessons by Ellen G. White, pages 33 to 89. You can read this text online or you can get a copy of the book at The Adventist Book Center. This text is a discourse on the parable of the sower as found in Matthew 13. Ellen White illustrates several spiritual lessons based on this parable. 7. Make a collection of 60 different kinds of seeds, of which only 15 may be collect­ed from commercial seed packages, the other 45 you are to collect yourself. Label each kind as follows: seed name, date collected, location collected, and collector’s name. Seeds are all around you. You can find them in many fruits, such as apples, oranges, pears, grapefruit, tangerines, strawberries, lemons. They are also present in many vegetables, such as cucumber, squash, pumpkin, corn (use popcorn for your collection), and beans of all varieties. Take a stroll through the produce section of a grocery store and buy some of these foods. It is especially fun to try new and unusual fruits and vegetables. Flowers also make seeds, so you can collect seeds from flowers that you already may have growing in your flower bed. You can also collect various seeds in the wild, including grass seeds, milkweed, acorns (and other nuts), clover, goldenrod, etc. Once you have exhausted these sources, go to the seed section of a store or a nursery. This should be reserved as a last resort. 8. Have in your collection four kinds of seeds from each of two families of plants, showing the similarity between the seeds of plants in any one family. The two families of plants are the moncots and the dicots. To see the difference, cut a corn kernel and a bean in half. The corn seed will be difficult to divide, but the bean will almost divide itself in half at the boundary between the two cotyledons.